One of the main faith passages we teach on in the New Hope Series is Romans 4:16-21. It describes Abraham’s faith. God made a huge promise to Abram in Genesis 15:1, one that would seem impossible. But verse 6 tells us, simply put, that he believed God. I have been doing a lot of remembering of God’s first promise to me concerning New Hope. Most of you have heard my testimony about it. That day in July 2001, I was sitting at that Center in Illinois, and the Lord spoke to my heart about there being a ministry like it here in Centerville. Over the following few years, everything included in that word God gave me, He fulfilled—just as He said. 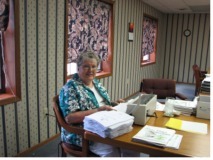 On March 27th, 2010, a very dear New Hope Volunteer passed away (Betty Russell, who had put together all of the books New Hope produces). We knew that we wouldn’t be able to assemble all of the New Hope Handbooks ourselves forever…things would eventually have to change. It was a very emotional day, and right after the funeral, we received some news that jolted us even further. But I knew right away that God had arranged for us to receive this news on the very day of Betty’s funeral. We found out that the building God had so miraculously provided for New Hope to operate in all those years—was going to be sold! Please keep in mind as you read the rest of this letter, that God first began to reveal His vision for the future, and then we found out the building was being sold. The sale did move slowly (which we know was God working out His perfect timing), but it is now official—the building has been sold. We so loved the facility we were in, but knew for awhile that as God continued to increase things for us, He would at some point ask us to step out in faith and trust Him for a new facility. We are forever grateful to Connie Drake for all she did in providing the first place for New Hope all those years—rent free. In each of our lives God brings changes. When those changes come, we can embrace what He is doing and step out in faith to obey Him, or choose not to. God had been ordering circumstances for both Connie and New Hope which required change and a move. He did this to bless Connie, to bless New Hope, and also the person who bought the building (a local attorney). Connie said it was only after my sharing with her the vision God was giving us for the future that she even considered selling the building. I think I always knew that “someday” New Hope would need its own building, but my heart just wasn’t in it, because the facility the Lord first provided for us was so perfect to fit our needs—and so very special to us—because of the “Upper Room.” I could not imagine leaving it. How could we leave the actual “Upper Room” where that prayer group had prayed for this ministry for so many years? Prompted by the news that the building New Hope had been using rent free for the past seven and a half years had been sold, we knew it was time to share with you the vision God had given us for the future of this ministry. Over the previous couple of years, He had been planting seeds of an expanded vision for New Hope to include retreats, in order to take groups of people through the New Hope materials in a shorter amount of time. This would allow the people to know what’s in the materials, not only benefiting from it themselves, but to be more quickly equipped to use the materials to help people in their own ministries or outreaches. God was also giving us an understanding of the great impact day and night prayer and worship can make on not only a ministry, but on society. A great longing of our hearts was to also include a New Hope Prayer & Worship Room where continuous prayer and worship will take place (see Day & Night Prayer & Worship article for more details). We hear a lot about reform these days. There’s call for government reform, welfare reform, health care reform…you name it—if it’s set up by the world’s system—it’s eventually going to need to be reformed. But if you look back through all of history, when true reform was brought to a society or nation, it began with God’s people being reformed. I heard a sermon recently about God pouring out His Spirit and raising up those who will be used to dynamically reform the Body of Christ, along with aspects of society in various places. Nehemiah was a classic example of a reformer who impacted the church and society. He is an excellent case study in courage and Biblical leadership in a time of reformation. The Scriptures describe incredible advances in the Kingdom of God with works of justice in society. This will increase dynamically in the end times. Jesus will shake all that can be shaken, so that the works founded on His words and purposes will become apparent, as they alone will “remain” through the shaking. Hebrews 12:28 says: “Wherefore we, receiving a Kingdom which cannot be moved, let us have grace, whereby we may serve God acceptably with reverence and godly fear: For our God is a consuming fire.” God’s end-time judgments will remove all that hinders love and His plans and purposes from being accomplished, especially all that involves injustice and oppression. As we continue to be obedient and prepare to fulfill all of the commission and vision God is giving us, He continues molding us spiritually, physically, and emotionally. “But now, O LORD, Thou art our Father; we are the clay, and Thou our potter; and we all are the work of Thy hand” (Isaiah 64:8).